Sometimes you come up with an idea you're really proud of and this is one of them. As many of you know I've been altering my veg beds to all be the same size, all 30" wide by 10ft long. The width is what has been recommend by many experienced market gardener, Jean Martin Fortier, Curtis Stone and Ellot Coleman to name a few. Having changed around about 40% of my beds over to this already I can really see the advantages, being modular it means that every bit of plastic/weed matting I cut for mulch can be used for any bed, the same applies to netting to cover crops. I don't have to search through to find one that fits. Also with this width bed it means I can weed or harvest the whole bed from one side. I was thinking that I should take it one step further and make up some frames that I could use as row covers. These frames could easily be moved over any crop that needed protection, without having to stake netting down or set up the hoops each time. So I made this and my mind got working again. 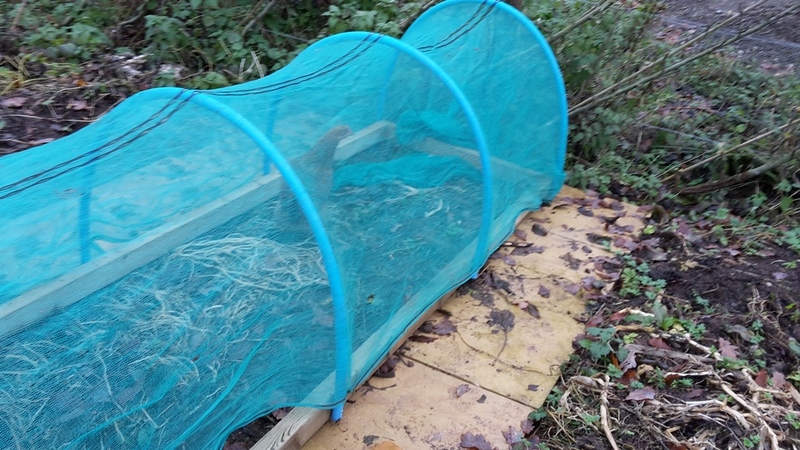 These frames could also be used for fleece or for clear plastic, making little poly tunnels to extend the growing season or grow more heat loving crops like tomatoes, peppers or chillies. This really increases my undercover growing area and should mean that I get crops earlier and later than I do now, or I can protect crops much easier. With some spring clamps I can hold up the side when I come to weed or to ventilate my mini poly tunnels in the summer. The frames were made easily with some treated 3x2 timber, and five lengths of blue alkathene pipe (cut to suit the size of netting I have which is 6ft in width). I inserted dowel into the bottom of each pipe so it wasn't squished when I screw it up. Netting is held down by clipping over some screws and washers but I'll also get some spring clamps. Cheap and built with materials that are easy to get hold of. The netting I use is scaffold debris netting as I find it stretches really well (I do have finer netting but I don;t tend to use it that much). Then I took it one step further again and decided to build a chicken coop to fit inside. This little coop is to house just two birds that can peck their way through all the bugs and weed seeds in a bed as well as finishing off what was left of a crop. The idea behind this coop is that it is suspended on the two hoops to keep it from the ground, preventing rodents from taking up residents under it. Also it increases the lifespan of the coop as if it's not in contact with the ground then it won't rot as fast. I made the coop very lightweight, out of left over roofing batten and left over uPVC fascia board that I used as cladding (I hate cladding in plastic but better than it going to the tip and it was a free!). I didn't fit a bottom to the coop meaning that their dropping fall straight to the ground, although half of the coop is taken up with a nest box (which they are already using). 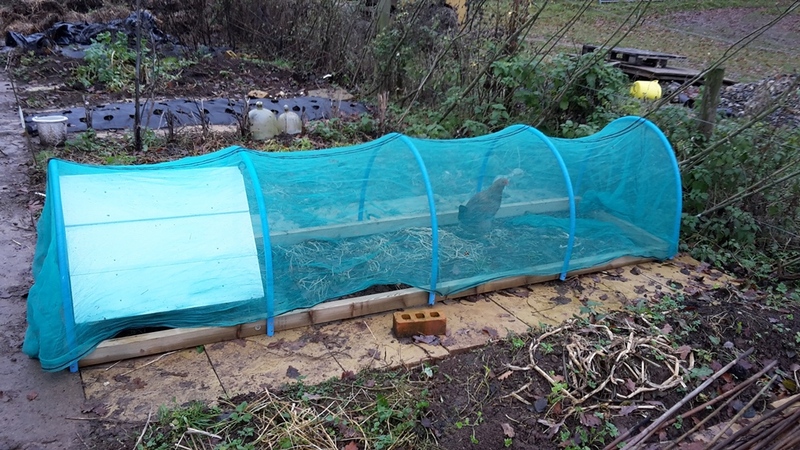 Hopefully the chickens won't mind this, but if the lack of a bottom affects them I can soon alter it. 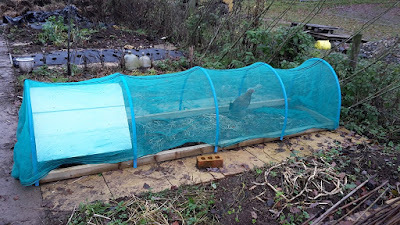 As for fox proof the fox won't be able to dig under it as all my beds are surrounded by slabs but he could bite through the netting, although I think this is unlikely as my veg beds are quite near the house. Time will tell on this one! I think I plan on making about four of these frames up to start with and I'll see how I get on with them. The chickens are already in the first one I made and really enjoying being put on a fresh bed and digging through it. I'm looking forward to getting some poly tunnel plastic and making my mini poly tunnels, should really increase what I can grow next year! Please watch the video and let me know what you think of my new idea! Who would want some of these in their garden? Good idea, my beads are all the same size so things can be interchangable. Looks good. Our new beds aren't the same size as they are designed to fit the space that is there however I'm good with that. It's looking really good for you, well done on the prototype! I should send you about a hundred of my nasty chickens and you could build little blue houses for them! They would be illegal immigrants, I guess. But maybe not as they started out with 2 roosters and 3 hens, all English fighting chickens. So maybe they would just be returning to their ancestral home. I feel sorry for any poor fox that tangled with my chickens. They are the flock from hell.